I wanted to try something to make sure I post something educational once in a while and people seemed to enjoy my trip down memory lane for the Blog Carnival last month. As gimmicky as it sounds, I’m going to try it based on how much information I can find/how much I can remember about an old product used at some point in my diabetes care. It could be the technology I used, a specific treatment, etc. etc. I’ve been a member of the T1D Club for a while now, so it might be beneficial for the crowd newer to the table to see what life was like growing up. Today’s submission – the Glucose Tablet. 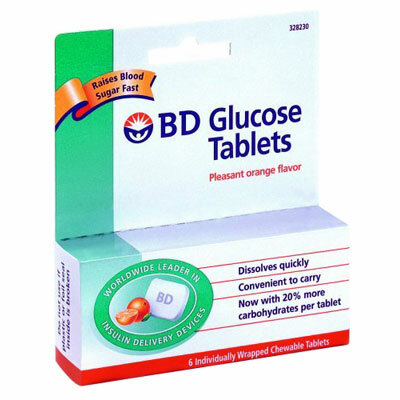 BD produced some of my earliest forms of glucose tablets. They were white, square tablets that were individually wrapped in blister packs, which I remember carrying around in grade school in my backpack. (So – maybe the late 80s, early 90s?) They were discontinued in 2009, making way for the current Dex 4 and my current favorite, Glucolift. They were orange “flavored” and I once tried to write on the chalkboard at school with one of them. Seriously. If that’s any indication as to how they tasted… which kind of defeated the point to having them. If you were hypoglycemic, why would you want to treat it with something you despised eating? You were probably already moody enough. The benefit to these were that they were individually wrapped, so they didn’t spill (or melt) all over purses and backpacks, and each tablet was 5 grams of carbs, making the 15:15 rule easy to follow. Whereas, these days, a standard glucose tab is 4 grams [/math fail]. In a pinch, however, I did have my fair share of these. Reluctantly, of course. So that’s #tbt. What else would you like to see covered? Don’t forget about how HARD those things were! You need a pretty strong set of chompers to bite down on those things! What’s funny is that I thought that was limited to my experience. Since I’d use the tabs as a last resort, they’d sit in my backpack for a long time. So I thought they were just stale.